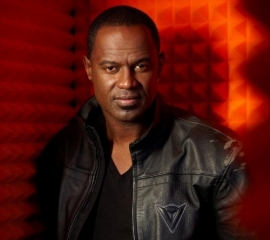 Grammy winning music artist adds a VocalBooth to his personal studioBrian McKnight has expanded his repertoire to add producing music artists as well as hosting his own television talk show. Known as a talented singer-songwriter with multiple awards and nominations to his credit, throughout his career he has collaborated with a variety of musicians including Mariah Carey, Mase, Sean "Puffy" Combs, Mary J. Blige, Justin Timberlake, Nelly, Vanessa Williams, Ivete Sangalo, Kirk Franklin, For Real, Canibus, Quincy Jones, Boyz II Men, Christina Aguilera, Regine Velasquez, Shoshana Bean, Gordon Goodwin's Big Phat Band, Rascal Flatts, Talib Kweli, MJG (of the Southern Rap duo Eightball & MJG), Josh Groban (on his 2007 #1 Christmas album Noël), Justin Bieber, and CeCe Peniston. Brian chose a small yet roomy Custom 4 x 4 Gold Series VocalBooth which he uses for vocals and small instrument recording. A talented multi-instrumentalist Brian can play nine different instruments! Fourteen if you were to include a Kazoo, Jews Harp, Tambourine, Spoons and Whistling. Brian’s talent requires the best and he trusts VocalBooth to deliver the sound control he needs for writing, singing, and producing. McKnight's vocal style draws from Stevie Wonder (particularly in his use of melisma), Michael Sembello, Michael McDonald, Kenny Loggins, and his own brother, Take 6 co-founder Claude V. McKnight. Soul singer James Ingram also strongly influenced McKnight. His music production sensibilities especially his penchant for piano based pop ballads, method of background vocal recording and melismatic voice inflections all draw heavily from Ingram. Brian McKnight also has the uncanny ability to mimic the timbre and style of other singers such as Nat King Cole, Stevie Wonder, Marvin Gaye and Prince. McKnight in 2004, co-wrote with Australian Soul artist Guy Sebastian the song Wait which is a track off the Beautiful Life. In October 2007, McKnight made his Broadway debut in the show Chicago. In 2009, he appeared in the second season of Celebrity Apprentice. Each celebrity played to raise money for the charity of their choice; McKnight elected to play for Youthville USA. In September of 2009 The Brian McKnight Show, a late night talk show, premiered and is currently in syndication. The show is a combination of talk and variety.